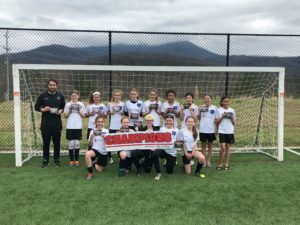 CSC 2006 girls gold competed in the Gatlinburg Spring Classic March 24-25. They won their first game against Alliance Cincinnati 2-1. With Zara McCarthy scoring 1 goal and Ileanna Wilson scoring 1 goal. The second game we played JCFC and won 1-0. McCarthy scored the goal. In the Championship game we played JCFC. Meira Volk had a huge save to maintain the lead and win the game 1-0. McCarthy scored the goal. It was truly a team effort. The girls played their hearts out. Thanks to Coach Neal Sharma and Congratulations CSC 2006 !